Old map by VISSCHER -Orbis Terrarum Tabula Recens.. Title: Orbis Terrarum Tabula Recens.. Size: 12.0 x 18.5 inches. 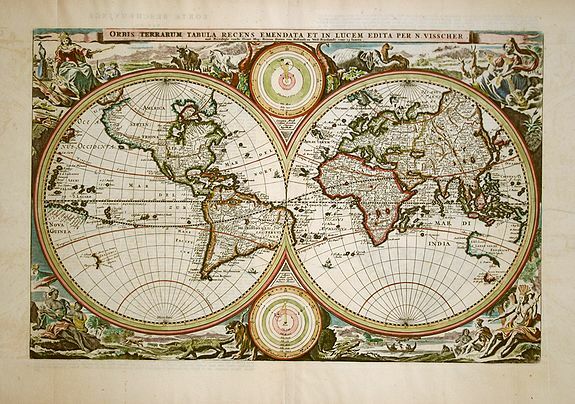 This is a very unusual nineteenth century edition of one of the most popular world maps of the seventeenth century. First produced in 1663, this map appeared in a Dutch bibles as late as the 1780's (as noted by Shirley) and then reappeared in this bible in the mid 19th century. Classical engravings including allegorical representations of the continents as well as native inhabitants and wildlife surround the double hemisphere. The cartography has not been updated. Two diagrams depicting the Ptolemaic and Copernican theories of the solar system appear within the cusps of the hemispheres. Printed on machine-made paper, apparently from the second state of the plate, with Dutch text on verso. Reference: Shirley, World 431 (for the early edition)..